With the first of November just around the corner, writers everywhere have stockpiled paper and food and bid farewell to their family and friends as they prepare to hole up in their writing caves until December 1. November is National Novel Writing Month, also known as NaNoWriMo, an annual internet-based creative writing event that challenges participants to write a new 50,000-word novel in thirty days. The project was founded by Chris Baty in 1999 with twenty-one participants, and the official NaNoWriMo website was launched the following year. The number of registered participants has grown steadily every year, and the affiliate Young Writers Program and official podcast were developed in 2005. A summer version of NaNoWriMo (Camp NaNoWriMo) was introduced in 2011. In 2017, over 402,000 writers from six continents registered for the challenge, and over 58,000 ended the month as novelists. The novel can be on any theme and in any genre. However, it cannot be a project already in progress. Writing of the new novel cannot have commenced prior to midnight on November 1, and the 50,000-word mark must be reached by 11:59 p.m. on November 30. While I will not be working on a new novel during NaNoWriMo, I will be researching and crafting approximately twenty-five new pages or 7,500 words of my developing dissertation in November. For a comprehensive list of FAQs and guidelines, visit the website at www.nanowrimo.org. The project was founded by Chris Baty in 1999 with twenty-one participants, and the official NaNoWriMo website was launched the following year. The number of registered participants has grown steadily every year, and the affiliate Young Writers Program and official podcast were developed in 2005. A summer version of NaNoWriMo (Camp NaNoWriMo) was introduced in 2011. In 2016, over 384,000 writers from six continents registered for the challenge, and over 34,000 ended the month as novelists. While I’m not working on a new novel during NaNoWriMo, I am committed to writing twenty-two new pages or 6,050 words of my developing dissertation—not bad for a writer with a full-time day job. 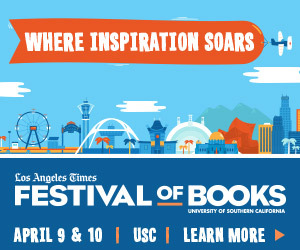 The 2016 Los Angeles Times Festival of Books begins Saturday, April 9, at 10:00 a.m. and continues through Sunday at 5:00 p.m. at the University of Southern California. The Festival is a wonderful opportunity to mingle with hundreds of authors, attend panel discussions with bestselling novelists and industry experts on writing and the publishing business, and enjoy live music, visual art, and cultural entertainment by some of the world’s most creative and celebrated artists. For a full list of authors and panels featured at this year’s event and to review the program schedule, visit the website at http://events.latimes.com/festivalofbooks. With the first of November upon us, writers everywhere have stockpiled food and bid farewell to their family and friends as they hole up in their writing caves until December 1. November is National Novel Writing Month, also known as NaNoWriMo, an annual internet-based creative writing event that challenges participants to write a new 50,000-word novel in thirty days. The project was founded by Chris Baty in 1999 with twenty-one participants, and the official NaNoWriMo website was launched the following year. The number of registered participants has grown steadily every year, and the affiliate Young Writers Program and official podcast were developed in 2005. In 2010, over 200,000 writers registered for the challenge, and nearly three billion new words were written. A summer version of NaNoWriMo (Camp NaNoWriMo) was introduced in 2011. While I’m not working on a new novel during NaNoWriMo, I am committed to writing twenty-seven new pages of my developing novel or approximately 6,700 new words—not bad for a writer with a full-time day job. April is National Poetry Writing Month, also known as NaPoWriMo, an annual creative writing event that challenges participants to write a new poem each day from April 1 through April 30. NaPoWriMo coincides with National Poetry Month, which is celebrated annually in America and Canada. The project was founded by Maureen Thorson in 2003 and modeled after NaNoWriMo, or National Novel Writing Month, which challenges participants to write 50,000 words of a new novel in the month of November. Since its inception, the number of registered participants has grown steadily every year, and many writers’ organizations coordinate NaPoWriMo activities. For a comprehensive list of FAQs, guidelines, and daily prompts, visit the website at http://www.napowrimo.net. With the first of November just around the corner, writers everywhere are stockpiling food and saying farewell to their family and friends as they prepare to hole up in their writing caves until December 1. November is National Novel Writing Month, also known as NaNoWriMo, an annual internet-based creative writing event that challenges participants to write a new 50,000-word novel in thirty days. Many of us in Chapman University’s MFA program have impending thesis deadlines, and the NaNoWriMo challenge gives us the perfect opportunity and support to complete this critical component of our degree requirements, particularly if we have decided to start a new project for the thesis or complete a novel rather than a collection of short stories. Presented annually by the UCLA Extension Writers’ Program, the Writers Studio brings together a community of writing students to workshop with some of Southern California’s most esteemed professional writers and teachers. 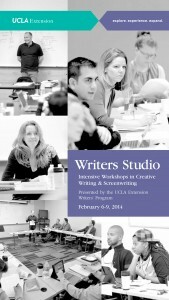 Participants select one of ten intensive four-day workshops in creative writing and screenwriting planned for the 2014 Writers Studio, including Courage and Craft: A Writing Workshop to Jumpstart Your Creativity, Writing the First Novel, Writing the Young Adult Novel, Novel Revision Techniques, and Writing Memoir and Personal Essay. Enrollment is on a first come, first served basis, and each class is limited to fifteen students. Early registration is strongly advised. The Writers Studio fee of $895 ($815 through January 6, 2014) includes enrollment in one four-day workshop February 6-9, a continental breakfast on Thursday, a special Saturday guest speaker event, and a Sunday reception. For more information and to register, visit the website at http://blogs.uclaextension.edu/writers/programs-services/writers-studio.